We are back from four, exciting, long, HOT days at the Durham Fair. It was an amazing experience. Butterflies were born in front of people’s eyes. Caterpillars turned to chrysalises as we watched. So many people got to release monarchs in the new butterfly garden that Natureworks help to install. My staff worked REALLY hard, talked until they couldn’t talk any more, and taught thousands of people about butterflies. Diane stayed at the fair until10:30 Saturday night and didn’t get home until 11:30 because of the traffic. People still wanted to talk about butterflies at 10 at night? You betcha. But even SHE will tell you it was worth the work and the time. Believe me. 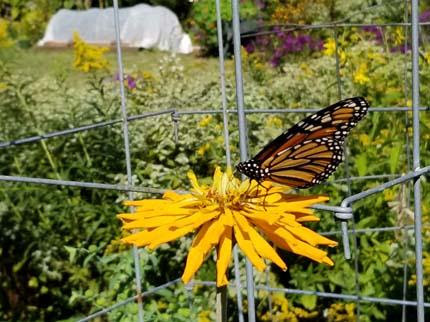 I gave a talk on Planting for Migrating Monarchs. Click here to link to the Natureworks You Tube channel and watch it. The first part is about the monarch life cycle; later in the talk I really explain our favorite plants for this time of year. 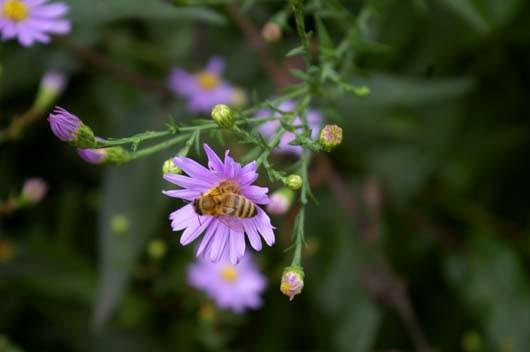 Bees cover a goldenrod plant, getting their fill of nectar in the fall. 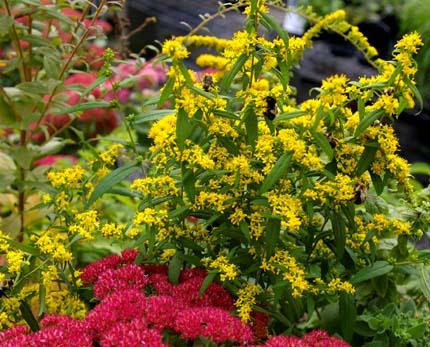 Teaching people that goldenrod is a great native plant, does NOT cause allergies, and should be included in the fall garden is one of our missions right now. We carry many different kinds. Sometimes I think to myself “Why do we do what we do?” Usually it is at the end of a hot, humid day when all the plants are wilting, everyone is exhausted, and the phone keeps ringing off the hook. Finally, I walk out into the gardens and stroll around. I breathe and relax. 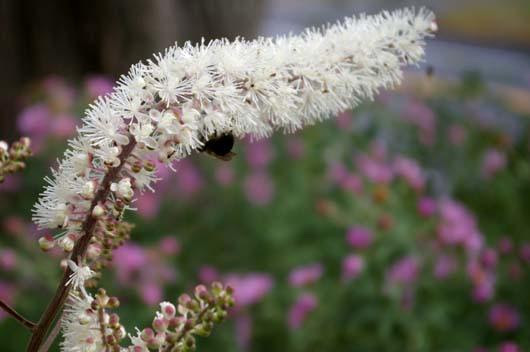 The bees are buzzing. The flowers call to me. Birds are singing. Butterflies flit about. It is a little bit of paradise. I turn my mind to the business conducted that day- gardens planted and cared for. Questions answered. Plants unloaded and displayed. Designs done. Problems solved. Teamwork, pulling together with a most magnificent group of dedicated, intelligent, creative, resourceful people, made it happen. But more importantly, we made a difference. We taught people about organic gardening, growing their own food, pollinators, habitats, and how to create a sustainable landscape. That is our mission. That is why we are here. 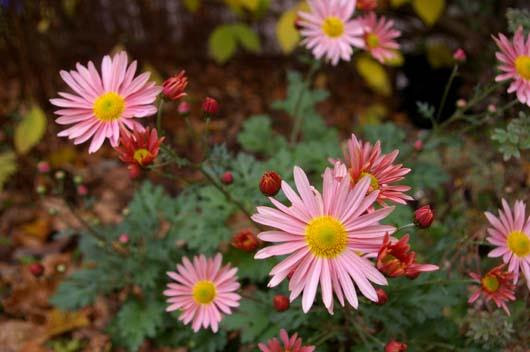 Cambodian Queen perennial mums are a single daisy form and great for the pollinators in mid-late October and beyond. stopped dead in my tracks. It was literally covered with bees, so many that I did a video. There were two monarch butterflies, a painted lady, and a fritillary. 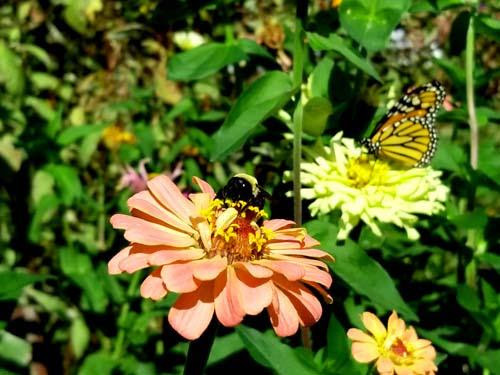 I went over to the zinnia patch- more butterflies. I was stunned. There have been very few butterflies since I got home from vacation, but today, they decided to come to my yard and have a party! This afternoon I had a meeting on my deck with 7 women- together we are planning an absolutely fabulous conference this winter for CT Hort. It was hot (but we were enjoying cold salads and “refreshing beverages”) when all of the sudden, someone said “I smell something sweet. What is that?” It was my Cimicifuga ramosa ‘Atropurpurea’, fragrant snakeroot, that I planted purposely next to the deck for just that purpose. A fun meeting was made a bit more magical. I have pollinators galore. Never mind goldfinches and chickadees and other creatures who all get their fair share of the bounty. No, I don’t net my blueberries or elderberries from the birds and I still get enough. 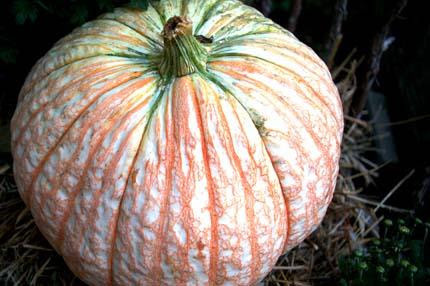 A few of my ‘Baby Butternut’ squashes were nibbled by squirrels or rabbits, but I have a trug full, so I am satisfied. If I miss a ‘Autumn Britten’ raspberries and they get too ripe, I pick them and leave them next to the water bowl for Earl the squirrel who visits every day. Why do we do this? Because we are so completely rewarded by the life that supports us and that we support. We are all one. We are in this together with the plants and the creatures. Tomorrow I am driving down to Fairfield to give a talk about The Healing Power of Plants to the garden club. I originally gave this talk at the Smilow Cancer Center and have given it countless times since then. Every time it touches something deep inside my audience. Yes, I go into herbs for various purposes, but more importantly, I talk about the grounding and centering effect of working with the earth. It is vital, especially now. I have had to shut down the news a lot since I returned from my quiet, unplugged escape in the Adirondacks. It is just too much to process. It’s not that I don’t care or that I am not worried. But I am no good to anyone if I am consumed by worry and fear. My solution? Go outside. Pull weeds. Groom the garden. Deep soak my recently planted trees and shrubs while quietly contemplating the life around me. It works. I recommend it as a daily ritual. 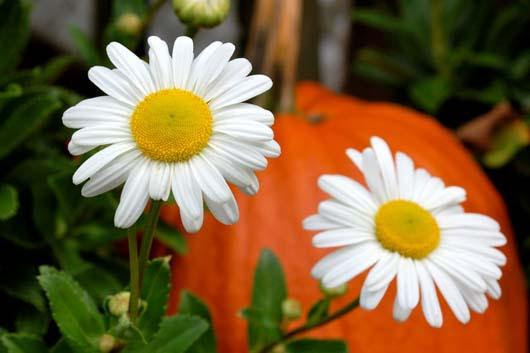 Even a simple Montauk daisy blooming against the backdrop of an orange pumpkin can inspire at this time of year. 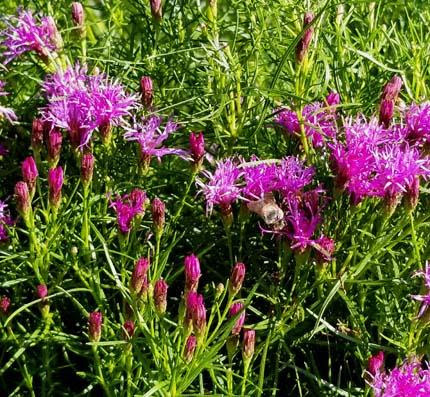 Purple puffs of Vernonia ‘Iron Butterfly’ is beloved by bumblebees. 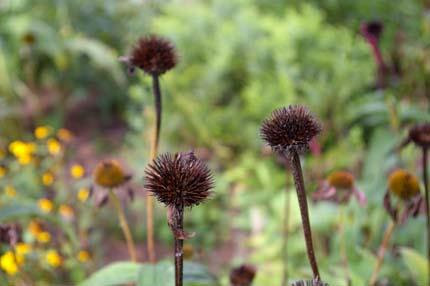 Leave up some of the seed heads of Echinaceas, Rudbeckias, and sunflowers. Grow your own birdseed! of deep purple ‘Iron Butterfly’ ironweed. Sedums and Eupatoriums of all sorts. And we don’t forget the birds… we leave the seed pods up in our flowerbeds of Echinaceas and other nutritious plants. Why put out birdseed now when you can grow it right in your gardens? summer outside. The weather will challenge us as gardeners, but we will prevail. Eventually, cool weather will return, and hopefully the deep, soaking rains that we were expecting last week will arrive, kicking off the garden rearranging season. Planting continues unabated, as the soil is so warm and the roots of the plants we are putting in the ground have their best chance ever to spread out and establish in our long, lingering falls here in CT.
Be sure to tune in Thursday afternoon to Facebook Live at 4 pm. I will be explaining how to choose and plant bulbs in containers and get them ready for forcing on your winter windowsill. It is SO easy to do and RIGHT NOW is the week to do it to assure color when you need it most. 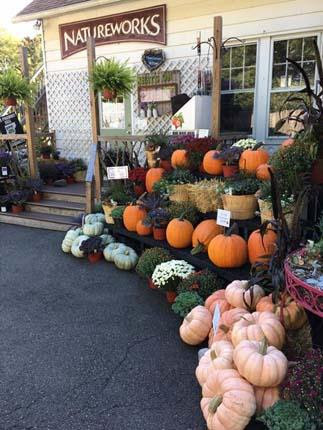 It’s hard to imagine when it’s nearly 90 degrees outside in late September, but eventually, you will be cooped up in the house longing for your garden. When you pull a few pots of fragrant Narcissus up from the cellar and they unfold to fill your house with their sweet perfume… well, let’s just say, watch this episode of Facebook Live and you can thank me in January! Oh yeah, have we got bulbs! 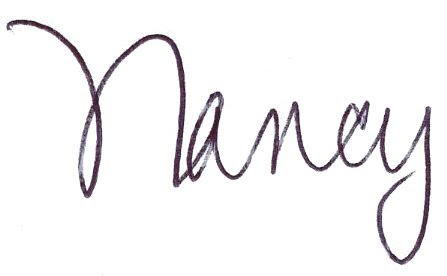 that I will be working on in October. I will explain how to analyze your gardens for problem spots and get ORGANIZED to fix them in the month ahead. This is a mixture of basic design ideas and practical information on digging, dividing, and rearranging. When you stop by this week, make time to walk in the gardens and check out the single and double Colchicums in bloom. These are fall blooming bulbs and they have gotten quite amazing over the years. They are so hardy and have resisted the attacks of chipmunks and voles and continue to increase. 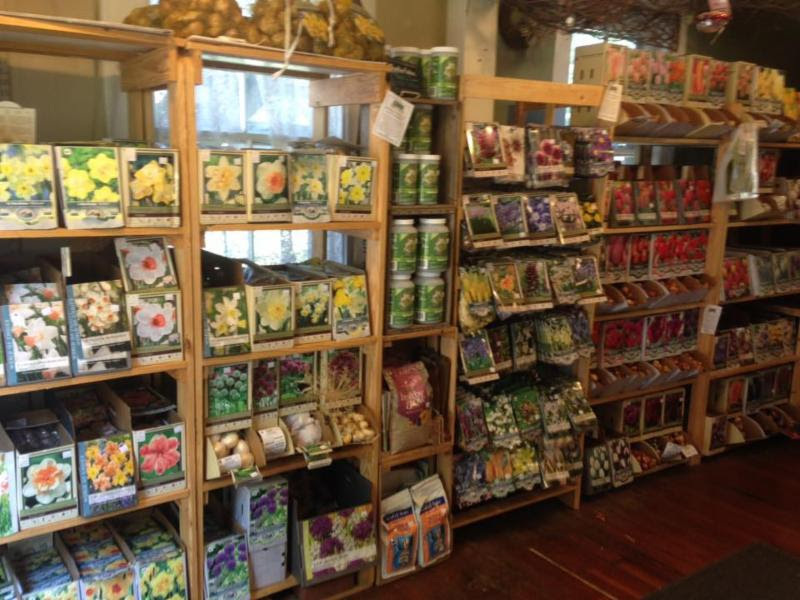 They will bloom for the next month and we still have a good stock of bulbs so you can plant some in your own gardens for a very special surprise next fall. 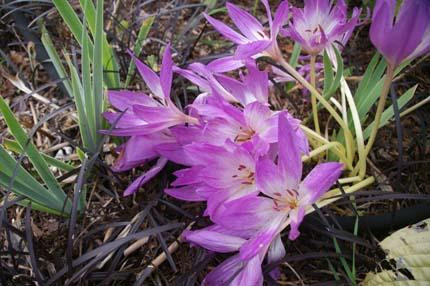 We also just got in the bulbs of saffron crocus, another fall bloomer that graces us with its flowers in November. The stigma of each flower is actually the spice saffron-grow your own!